View More In Coffee Machine Accessories. EQUIP YOUR INNER BARISTA with Barista Warrior's Coffee Filter. The Barista Warrior coffee filter was designed to equip you with a quality coffee dripper so that you can brew pour over coffee like a barista. We believe that the best coffee does not come from coffee machines, and not even from boutique coffeehouses, but from the kitchen in your home. We have created this coffee filter to equip you with a premium barista-quality tool for making pour over coffee at home. COMPATIBLE WITH CHEMEX AND HARIO V60: This pour over coffee filter was designed to fit Chemex coffee makers (6, 8, 10 cup) and Hario V60 02 and 03. 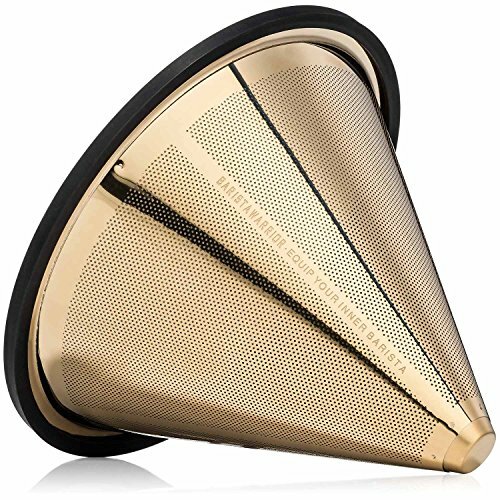 Made from titanium coated stainless steel, this gold pour over filter will also fit most coffee drippers. REUSABLE COFFEE FILTER | NO MORE PAPER: Paper filters inhibit the brewing process by blocking the majority of coffee's natural oils and nutrients. Our permanent coffee filter is a more economical and eco-friendly alternative to paper Chemex filters. BETTER TASTING COFFEE: The metal coffee filter has dual filtration, with a stainless steel mesh on the inside, and a laser-cut filter on the inside. Our customers rave that this cone coffee filter makes much better coffee than traditional paper filters! EASY TO CLEAN: After use, simply dump your coffee grounds and rinse your gold tone coffee filter under warm running water. We recommend every 2-3 weeks to descale the pour over filter by soaking it in a solution of distilled vinegar and warm water. NO RISK PURCHASE: We take pride in the quality of our products and back it up with a 6 month manufacturer's guarantee. If you are not satisfied with your pour over coffee filter, you return it, within the first 6 months, and receive a FULL refund. If you have any questions about this product by Barista Warrior, contact us by completing and submitting the form below. If you are looking for a specif part number, please include it with your message.